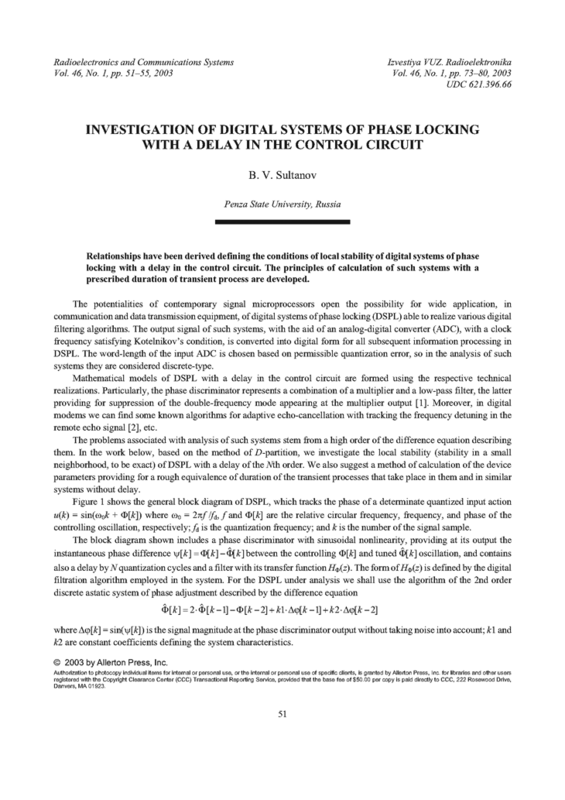 The relationships have been derived defining the conditions of local stability of digital systems of phase locking with a delay in the control circuit. The principles of calculation of such systems with a prescribed duration of transient process are developed. SHAKHTARIN, B.I. Analysis of Locking Systems under Interference Conditions [in Russian]. Moscow: IPRZhR, 1996. LING, F. "Echo cancellation," USA Patent No. 4813073, Int. Cl. H04L 5/14, published 4 March 1989. ASTAPKOVITCH, V.F. ; ET AL. "Rezultaty eksperimentalnykh issledovanii tcifrovogo UPS-9600," Elektrosvyaz’, n.7, p.29-32, 1986. QUATIEI, T.F. ; O’LEARY, G.C. "Far-echo cancellation in the presence of frequency offset (full duplex modem)," IEEE Trans. Commun., v.37, n.6, p.635-644, June 1989. DOI: https://doi.org/10.1109/26.31148. ZHODZISHSKII, M.I. (ed.). Digital Systems of Phase Locking [in Russian]. Moscow: Sov. Radio, 1980. SULTANOV, B.V.; ET AL. "A digital device for phase locking," SU Patent No. 1225034. OIPOTZ, n.14, 1986. SOLODOVNIKOV, V.V. (ed.). Technical Cybernetics. Theory of Automatic Control, Book 1 [in Russian]. Moscow: Mashinostroyeniye, 1967.